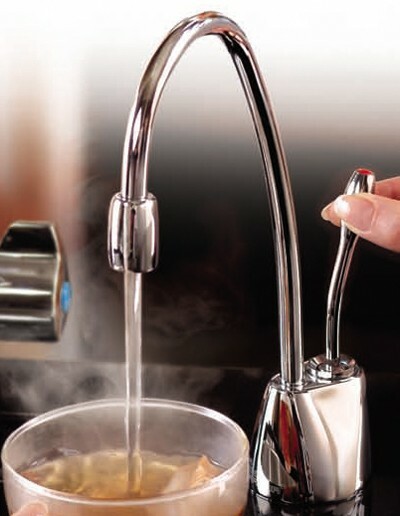 InSinkErator Hot Water > Steaming Hot Filtered Kitchen Tap (Chrome). Kitchen tap with instant steaming hot filtered water. Chrome finish. Instant heater and filter included. Can be used for cooking, hot drinks, baby care and cleaning. Boiling hot water dispensed at 98 Degrees. Filter reduces chlorine, lead, turbidity etc. 2.5 Litre stainless steel tank. Requires high pressure water system. Minimum 1.7 Bar pressure required. Tap to be mounted on work top or sink. 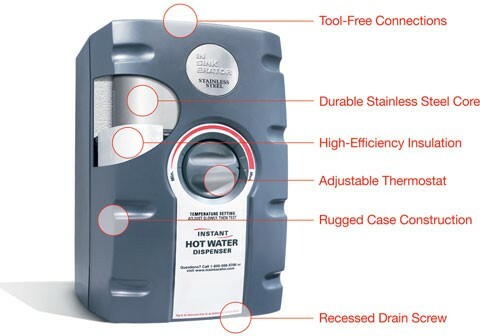 Instant self closing hot water valve. Gentle touch, single lever dispenser. This popular kitchen product, with instant, near-boiling water right at your kitchen sink can simplify countless cooking and cleaning tasks. Just consider how much time this revolutionary appliance can save you. You can brew gourmet coffee instantly, warm baby bottles, make instant soups, clean sticky pans, and do much, much more. This is a unique and welcome solution to the rapid pace of today's on-the-go lifestyles.